Three years ago someone sent me a link to a crudely-drawn comic series entitled “This is Why I’ll Never Be an Adult.” It featured a chart of extremely low standards, like the ability to accomplish “a few very minor tasks like grocery shopping and brushing my hair,” illustrations depicting a fiercely adorable woman “Going to the motherf*cking BANK like an ADULT,” and a handful other responsibilities before escalating to complete SYSTEM FAILURE. That was my first introduction to Hyperbole and a Half, and, needless to say, I identified, and began closely following her work. I was hardly alone. 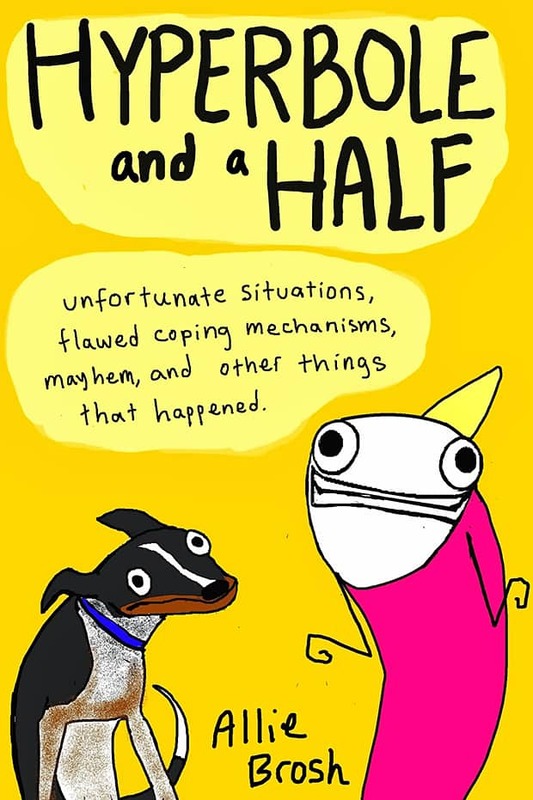 In the past few years Allie Brosh has accumulated 124,000+ Twitter followers, and 397,000 Facebook fans for Hyperbole and a Half. And, of course, the inevitable book deal. The book collects and shuffles 18 comic essays, some previously published on her blog along with some new material. I’m going to come right out and say it – her illustrations are awkward. Her comic avatar consists of a nearly shapeless pink rectangle of a body, stick limbs, and googly eyes that widen with excitement or surprise and shrink when she’s down. Her hair, that now iconic yellow triangle, serves as a barometer of enthusiasm or determination. Much like a dog’s ears it perks up to express eagerness and flops down when disappointed. The style is digital retro, and looks like it was drawn in MS Paint circa 1994, but it’s surprisingly effective. The comics are autobiographical, but often I find myself wondering if she’s secretly writing about me. She’s great at capturing complex emotions and motivations, especially when they don’t make any sense. Like eating an entire cake out of spite. Or dealing with a mentally challenged dog. Or writing a letter to your future and past selves, not realizing that they won’t be able to write back. Or the ways we trick ourselves into believing we’re wonderfully selfless, when really, faced with a crisis, most of us would knock over old ladies Costanza-style as we flee to safety. Or maybe that’s just me. And Brosh. And George. Brosh is silly, serious and unflinchingly honest, and I can’t recommend this book enough.